Soho Square ... modern living. 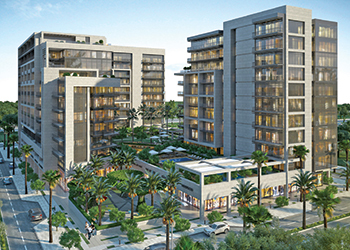 Bloom Properties has started the main construction works at its mixed-use Soho Square urban development on Saadiyat in Abu Dhabi, UAE. Emirates Link Maltauro, a leading construction group in the UAE, has been signed up to carry out the main works of the development which is taking shape in the University neighbourhood of Saadiyat. Soho Square is the second mixed-use development by Bloom Properties on Saadiyat encompassing top residential, retail and commercial spaces located in proximity to the New York University Abu Dhabi campus and major upcoming tourist attractions. The project has been a big draw for investors looking for solid returns on their investments and long-term capital appreciation, Bloom Properties states. Offering a modern and vibrant living experience, Soho Square will feature 302 high-end residences upon completion, ranging from studios to three-bedroom apartments, townhouses and a penthouse. The project will have a raft of commercial and retail facilities and amenities including restaurants, a swimming pool and a fitness centre. Bloom, he continues, is keen to strengthen its footprint in the Abu Dhabi real estate market by offering investors the best real estate products in the most premium locations.